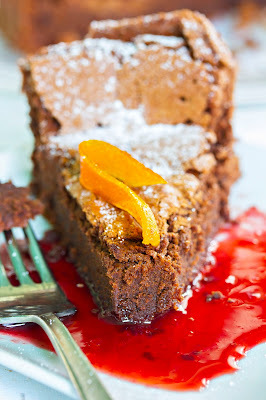 Chocolate decadence meets tangy orange sauce as two perfectly-matched flavors merge in this delicious flourless torte. Blood oranges are available for a few more months. Mix up the dark purple with the bright orange ones for the most colorful cake. Follow the recipe from the Steele House Kitchen website here. Note: I used Blonde Coconut Sugar in the cake.